Got company coming for the holidays? Here's a fun way to keep them busy. 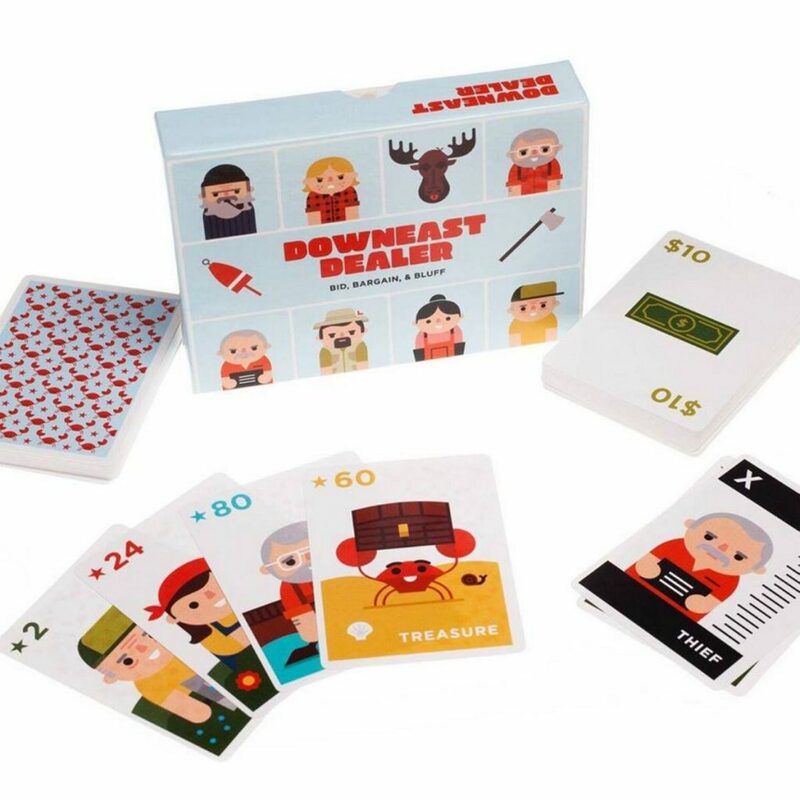 The world of Downeast Dealer, a Maine-based card game, sounds a little like Lake Wobegon, the fictional Minnesota town from the radio show “A Prairie Home Companion.” The game is populated with plenty of quirky characters based on real people. Players of Downeast Dealer (which is manufactured in Maine) try to collect sets of the most impressive items they can find at a fictional yard sale. Each item is assigned different points. The game includes a town auction in the basement of the community center where players sell items they found in their attics. As players put together small collections, they start bargaining with each other, just as the townspeople do on the dike in Machias. Most of the characters in the card game are based on real people, both alive and deceased. Players can bargain for a canoe, for example, from “the canoeist,” a character modeled after one of the family’s real-life neighbors – a registered Maine guide who owns and sell a lot of canoes. “The thief” is based on the small town’s ne’er-do-well, the guy who drops by to fix something and helps himself to a household item or two as he’s leaving. Olson and Harding based the thief’s caricature on the real thief’s mugshot, which was posted on the county website. Just two cards feature made-up images – the moose trophy and “the salty fisherman guy,” Olson said, who is inspired by the fisherman’s statue in Eastport. Downeast Dealer is a three- to five-person game that takes about 45 minutes to play. A second card game the cousins designed – called Yankee Swap, based on the popular Christmastime game – takes a different, faster approach. Yankee Swap has its own set of cards, can accommodate up to 10 people, and lasts just 10 minutes. The card games cost $20 each at downeastdealer.com, or you can buy them at Motifs or Strange Maine in Portland; Wilbur’s of Maine in Freeport and Brunswick; Bonnie’s Place or the Down East Shop in Rockport; Maine Boothbay Harbor Artisan’s Co-op in Boothbay Harbor; Center for Maine Craft in West Gardiner; and several other locations Down East all listed on the website.